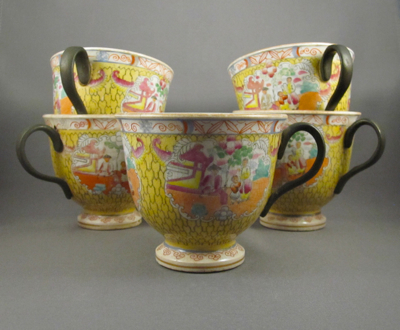 In the world of collecting, nothing pleases me more than stumbling upon items with matching inventive repairs, and this set of footed breakfast cups and saucers deliver five times over. 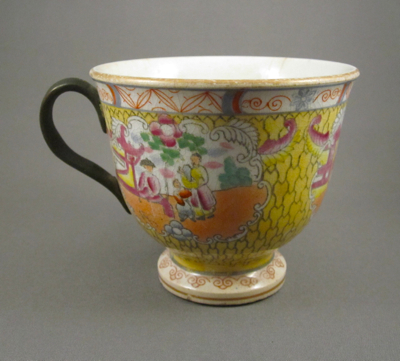 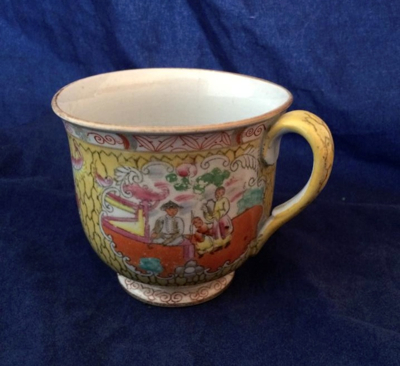 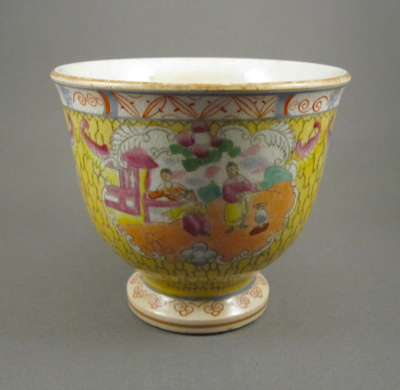 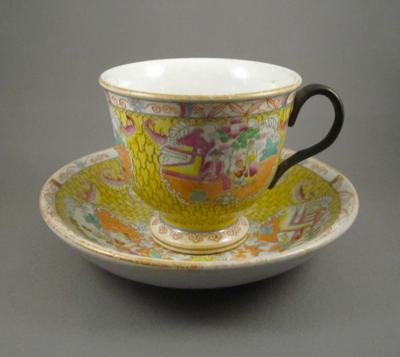 Made in England by Mason’s Ironstone from 1830 to 1840, these heavy porcelain cups, measuring nearly 3-1/4″ tall, have the transfer printed “Conversation” pattern in the rare yellow scale colorway. 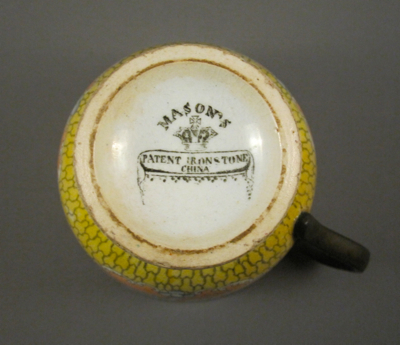 Each cup and saucer is marked in black transfer on the underside MASON’S PATENT IRONSTONE CHINA. 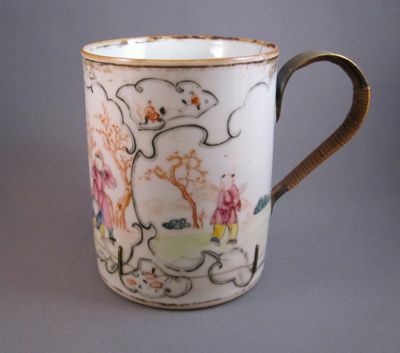 I purchased the set during my last trip to London from dealer Fergus Robert Downey who later told me that he has a sixth cup with an identical replaced handle, so I am hoping to one day have the complete sextet. 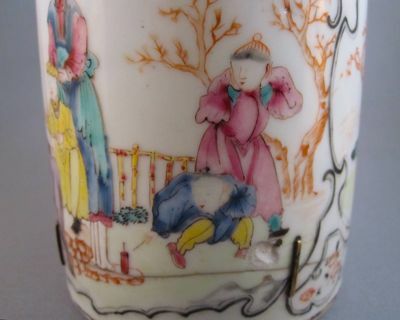 I can’t imagine that all of the original handles snapped off the cups at the same time, unless a particular breakfast got a bit too rowdy. 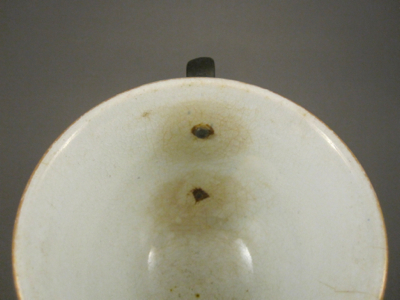 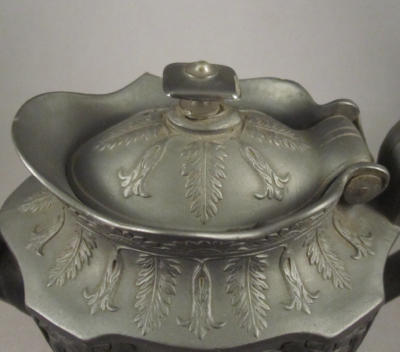 More likely, one or two handles might have broken off, so in order to keep the set looking uniform, the remaining intact handles were removed and all cups were fitted with the same metal replacement. 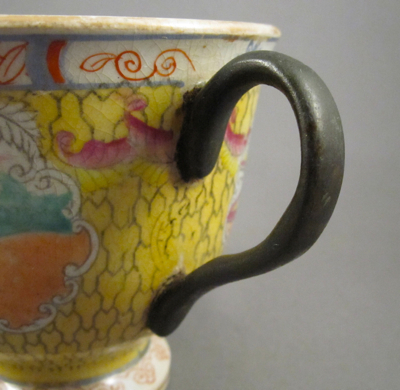 The metalsmith did a fine job, as all of the handles are well matched and expertly riveted to the cups. 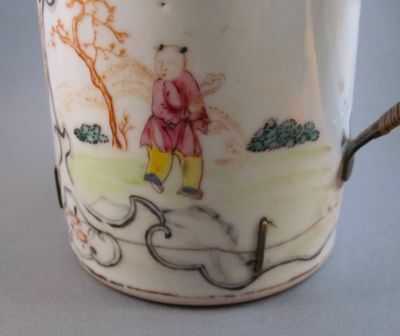 This cup, in perfect condition, shows what the original handles on my cups would have looked like before they took a tumble. 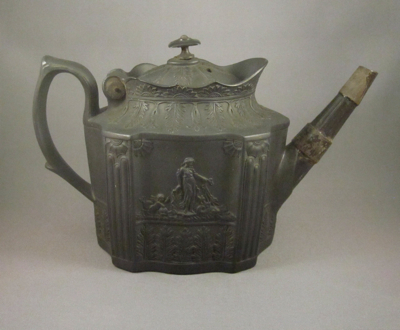 This handsome Castleford-style teapot with neoclassical design was made in England in the early 1800s. 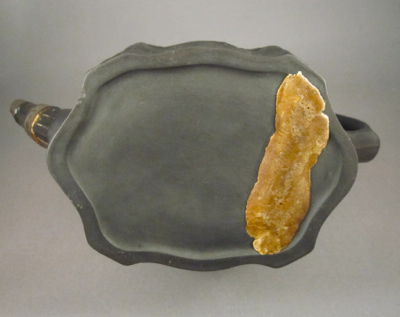 It is made of fine-grained unglazed black basalt stoneware with a hinged lid set in a scalloped rim and fastened with a metal pin. 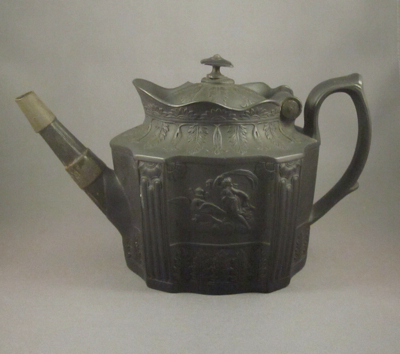 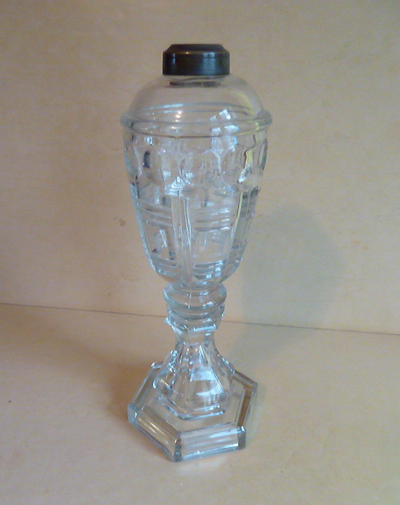 It measures 5-1/2″ tall and 8-3/4″ from handle to spout. 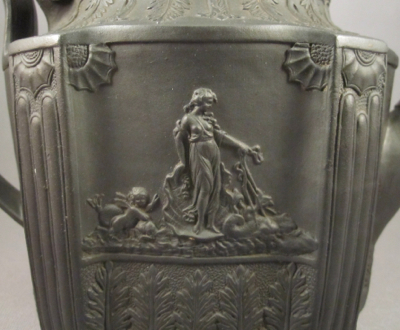 Two different classical tableaux in detailed relief are on each paneled side, with acanthus leaves at the top and the bottom. 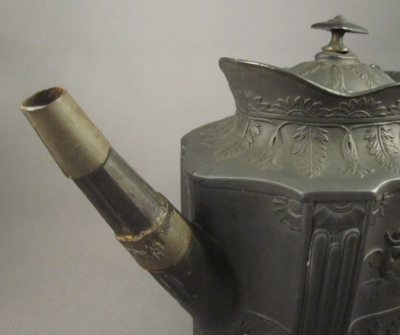 When this teapot was dropped over 150 years ago, the spout broke in two places and the knob came undone. 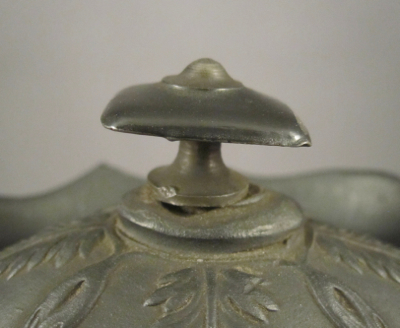 Typically, fragile lids on teapots with this design snap off so I am surprised that this lid remains intact. 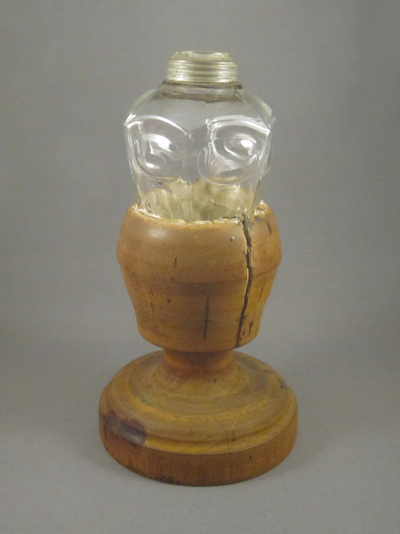 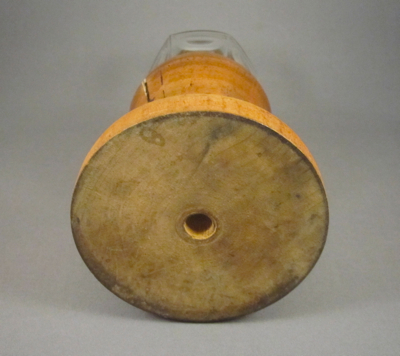 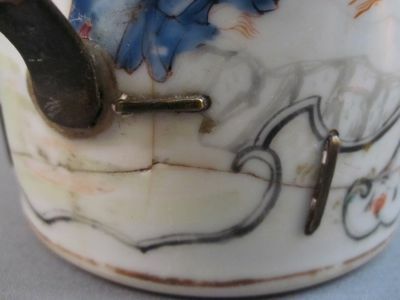 A 19th century tinker repaired all of the broken bits by attaching two metal sleeves around the breaks in the spout and riveted on a new metal replacement knob. 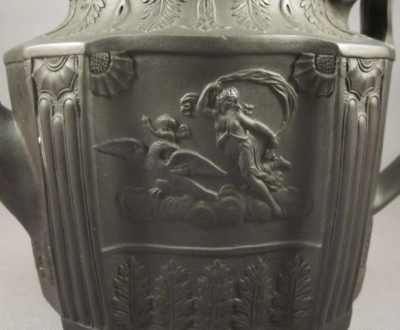 The metal repairs were originally painted black to blend in with the black basalt color of the pot, but time and age have peeled away the paint, leaving a pleasing patina to the metal. 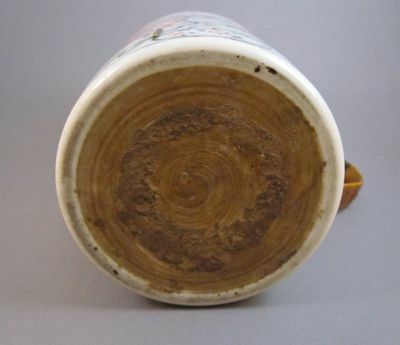 There is a later putty repair to a crack on the underside which is useless now, but I imagine it served its purpose at the time it was applied. 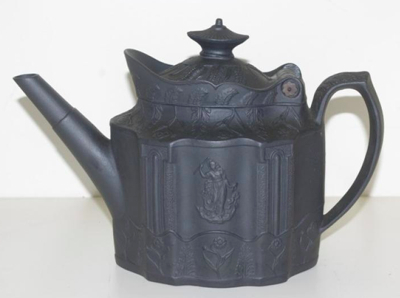 This example with nearly the same form, shows what the original spout and knob would have looked like on my teapot. 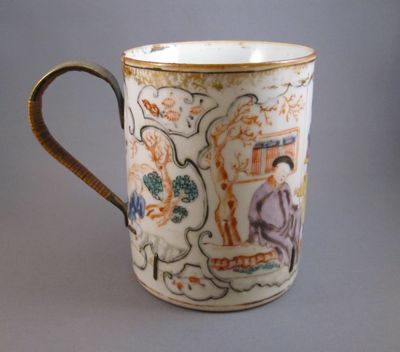 In honor of Independence Day I am pleased to share with you a Chinese porcelain mug with a fireworks theme, made for export to North America and Europe during the Qianlong period (1736-1795). 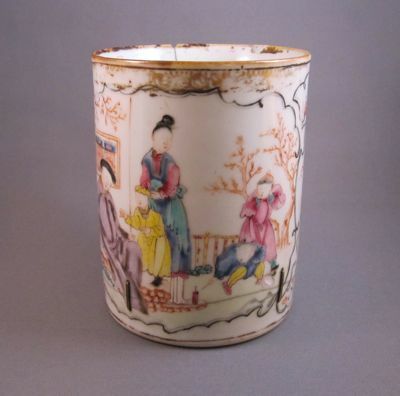 It stands 4-3/4″ high and is decorated in the Mandarin style with cloud-shaped cartouches executed in famille rose enamels, and containing floral sprigs and a family tableau depicting a child lighting fireworks. 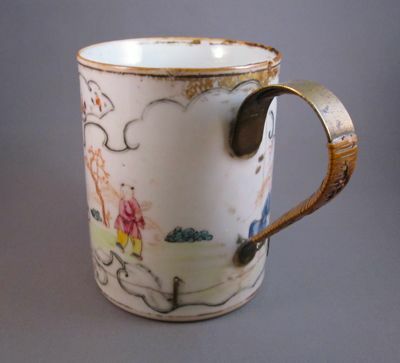 I wouldn’t be surprised if during the first organized 4th of July celebration in 1777, a raucous party involving the lighting of fireworks forced this mug to fly off a table and crash to the ground, causing its handle to shatter and the bottom to fall off. 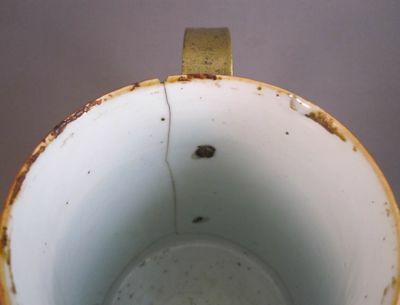 Rather than throw out the expensive and cherished mug, it was brought to a local tinker who fashioned a sturdy brass replacement handle. 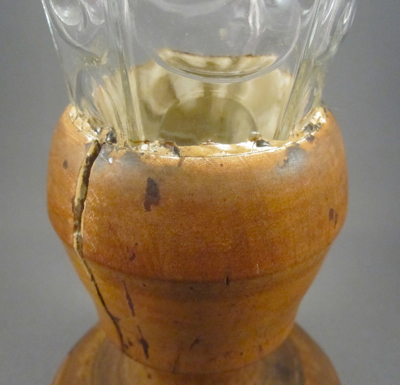 To help insulate the handle from its hot contents, it was wrapped in decoratively woven rattan. 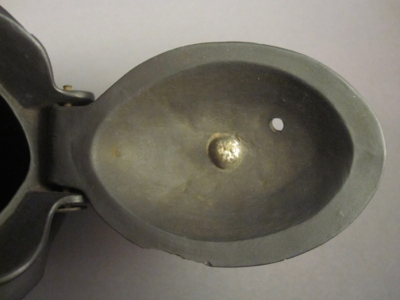 The bottom was reattached to the body using five large brass staples with a bond so tight it could hold liquid without leaking. 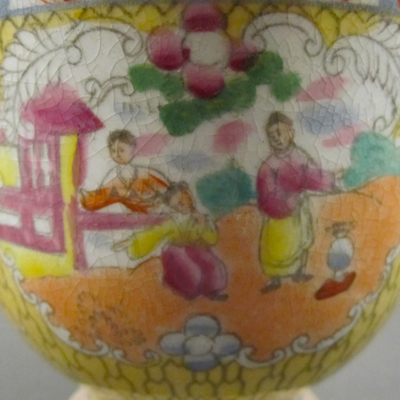 As china menders typically did not sign their work, there is no way to know who was responsible for this repair, but I imagine they each had their own signature style in weaving the rattan so that they could distinguish their work from each other. 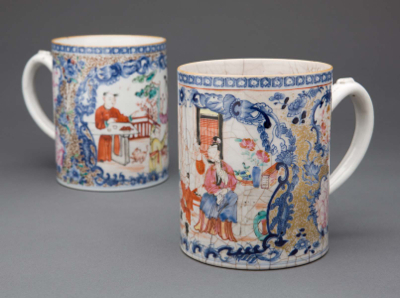 These mugs of similar form show what the original handle on my mug might have looked like.